UPDATE 6/5/2012 9:13am - Steps are being taken to fix the bug as I speak. The search box can now be disabled. If you had it previously disabled before the bug it will revert to that. However, there seems to be some vertical alignment issues to iron out. Horizontal navigation bars are being adversely effected. I'll keep you posted. This is kind of a bug report and update in one. Overall this is a small update, but one that will be very handy for company intranets and schools. 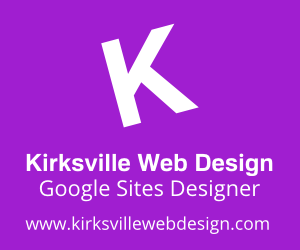 I hope to use it soon on Kirksville Web Design intranet projects. Even though you may have Search disabled, it seems to be showing up. 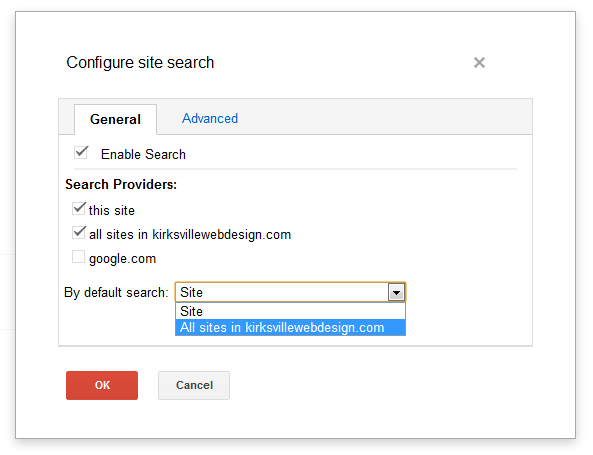 You can visit Manage Site > Site Layout > Site Search > the box will be unchecked. This may interfere with graphics that weren't made to take this into account. A small hassle, but still one that needs resolved. 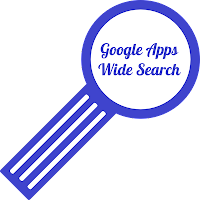 A new checkbox for search all sites in your Google Apps domain. You are no longer confined to searching within one site for what you need. To go along with this update, a drop down box specifying the default setting is available. Google Apps Wide Site Search Capability! Google Sites is received a bit more love in terms of intranet-helpful updates. Perhaps more integration with Google Drive is on the horizon. We shall see. How does this resolve the fact that the search box is still there? Any time frame as to when this bug might be ironed out? It is destroying the aesthetics of my header. It's not a small hassel for me. It's a major hassel. Why did this happen? I hope they fix it soon. specialized Website Design Company says that it is also imperative to provide the visual appeal to the site by satisfactory handling of colors. Discussing about the competence of colors, what would you think is the most perfect colors for the website? The rejoin to it is simple. Nice information shared here about site search update and bug. I like it very much. It will be really helpful to everyone. I am highly obliged to be here by getting it. This bug FINALLY seems to be fixed now. I can't see my site name in the header, even though I have it checked to show in the header. Yes Google Drive is going rock! Thanks so much for the share! As of 6/10 I still can't see my site name, even though I have it checked to show. Can you share your Site's url? I'll check it out. I would prefer to not post my url on ablog. I just have removed the header and put the logo in the content area. The problem now is when the page is adusted for text size on anyone's computer the headline font gets wrapped around and uneven and uncentered. Other websites just shrink porportionaly. Do you know why this is on google sites? I'm using a a blank slate template. I can now see my site title. My eader font color was checked white so it was me. I understand it all, thanks for sharing this to us! This blog is very helpful to me & I learn alot of new stuff here ! professional essay writers At ProfessionalEssayWriters.com, our highly qualified Professional Writers can help with all your academic paper writing needs. cheap resume writing service cheap resume writers that specializes in your specific career of interest. Our entire team is highly skilled and experienced with providing resumes that support your career goals. fighting online exploitation A website with a catchy name, a few nicely coined phrases to highlight a grand objective, and a host of eye-catching pictures and video downloads here and there. One cannot help but explore such websites, so dazzling and enticing their webpages, and so convincing and legitimate they appear. But often, innocent web users are duped by such bells and whistles, only to land into a host of problems and potential scams. press release writing service The purpose of a press release is to give media professionals and journalists information that is useful, accurate and interesting. writing a thesis paper we strive and do out best to provide every one of our clients with original papers, so our writers conduct their own research and write thesis papers without using someone else’s papers. On top of that, Thesis Paper editors sift every order for plagiarism and check it with the most up to date anti-plagiarism software. We understand that a plagiarized thesis paper can harm your image and might even ruin your academic career, so by turning to us you can be certain that your paper will be free from plagiarism.